Since I speak for a living, I am constantly flying all across the United States. I make about 91 flights a year. On all of the flights I take, they offer alcohol, and since I take so many flights, I have definitely seen more than a few people take advantage of the offering of those tiny bottles of booze up in the sky with us. So, I started to wonder, what happens to your body when you drink on a plane? Is it different than drinking at a lower altitude? Well to answer these questions, we first have to look at what happens when someone drinks normally. When somebody takes a sip of alcohol, all it takes is thirty seconds for that alcohol to travel from their mouth, down their esophagus, into their stomach, into the bloodstream, and finally hit the brain. Now, as soon as the alcohol hits the brain, changes in the brain start to take place. It will take about 30 minutes for the alcohol to take full effect and become fully metabolized into the bloodstream. At this point is where you would get an accurate blood-alcohol content rating, or BAC. Changes start to happen in the brain, such as people start to lose their inhabitations, making things that seemed like bad ideas to the sober mind, such as eating that entire 20 piece chicken nugget meal from McDonalds by yourself or calling up that old ex that you haven’t spoken with since the breakup, can seem like really good ideas in the moment. Other changes that occur are losing your ability to make a snap decision, and the ability to use your fine motor control skills. Now, changes also happen when people board planes and take off into cruising altitudes of 35,000 feet in the air. The higher the altitude, the less atmospheric pressure there is on objects. This affect the way that the human body absorbs oxygen. This is why some people can start to feel light headed when they fly, or even when they climb high mountains, this is called hypoxia. What this could mean for drinking alcohol is that even though someone could have the same amount of drinks that they would normally have on flat land and feel fine, because of the difference in oxygen levels in their blood, they will feel the effects of the alcohol a lot sooner. Even though their BAC will show the same as it would on land. 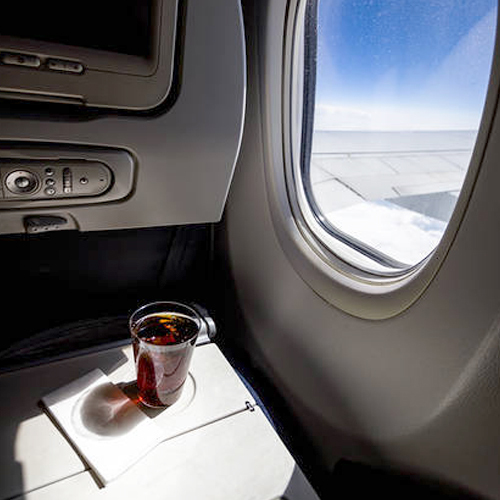 Even though speaking from a technical point of view, someone who is drinking one or two drinks on a plane won’t be any more drunk than someone who has had one or two drinks on land would be, the person in the plane because of the way their body is absorbing oxygen differently, they will feel more intoxicated than the person on land. Dehydration can also play a large role in why someone would feel more intoxicated on a plane than on regular land. Because of how dry the air is, and the diuretic effects that can happen as a result of flying, the human body has a tendency to become more dehydrated on a plane than it would otherwise. This can lead to someone feeling the effects of alcohol more strongly than they would if they were not flying. This can also lead to worse hangover symptoms and more alcohol-related discomfort. I definitely do not suggest drinking to excess at any time, and especially on a plane. But if you are over twenty-one and chose to have a few drinks now and then, please always remember to be safe. And if you’re going to drink on a plane, make sure you order some water as well because that dry air can make a hangover worse!